Do you want to join us in making a difference? COATS are raising money for the Building a Better COATS project. Every donation will help. Thank you in advance for your contribution to this cause that means so much to Crowthorne and the surrounding area. WHAT IS COATS? Crowthorne Old Age to Teen Society (COATS) is a charity that, for more than 50 years has, provided services and facilities for the senior citizens in and around Crowthorne. For the last 15 years we have run a day centre from our premises at Pinewood Avenue. From 9 am to 4 pm Mon to Thu and to 2:30 pm Fri our visitors enjoy: companionship, hot lunches, teas, activities and entertainment. We are a much-loved part of our community and enjoy strong support from the people and businesses of Crowthorne. In 2018 we served more than 100 individuals with over 4500 freshly cooked meals. We also operate a minibus service to transport visitors to and from our Centre. 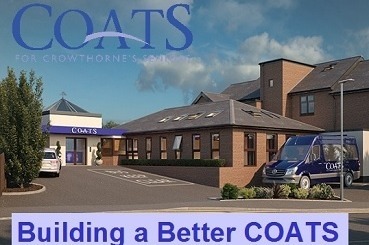 More information can be found at our website: coatscrowthorne.org.uk. Our premises at Pinewood Avenue have served us and the community well over the years but are now beginning to show their age and are in need of refurbishment. The Trustees would also like to improve and expand the services we provide. Working with architects and builders we have come up with a plan of improvements to our building that will support our future vision for COATS and allow us to offer even more to our community. · A new roof with skylights to let natural light in. · better access and entrance to our centre. · more internal space to give us more room for activities and events. · much needed storage space for equipment to support our activities. · modern audio visual systems connected to the internet. · much improved toilet facilities. Through careful financial management, strong revenue from our charity shop plus the generous support of a number of benefactors we have sufficient reserves to fund the building element of Building a Better COATS. However we are looking for donations to help us fit out the refurbished building with good quality fixtures and fittings. Every contribution, no matter how small will help us to do this.